Most of us struggle with our endless search for "the good life". Our quest for what we think will make us happy keeps us in "the grass is always greener" syndrome. Actually, the grass may be fine right where we stand today. And if we nurture it, we can even grow a garden! Today I'm simply going to appreciate the beauty around me. And going to start with the gorgeous lilies my man brought home. 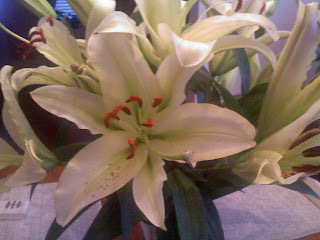 They are slowly starting to bloom and the house is filled with the smell of fresh flowers.